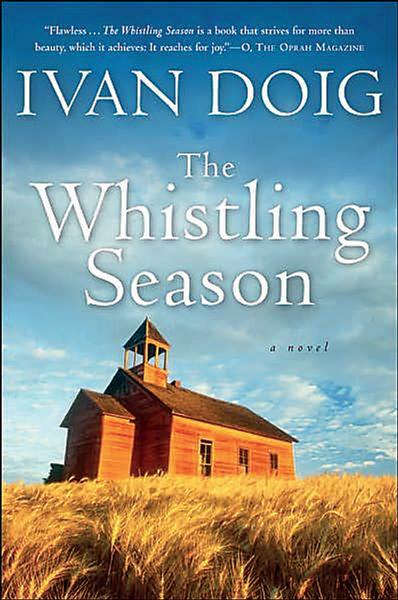 I read The Whistling Season in the weeks leading up to my vacation to Glacier National Park. I thought it would be fitting because the book is set in rural Montana and Glacier National Park is in Montana, too. I think I expected something like Little House in the Big Woods, except set in Montana. That is not at all what The Whistling Season is, though. It's narrated by Paul Milliron, a school superintendent who is now being forced to shut down many one-room schoolhouses in the area in which he grew up. He narrates the story of his childhood as he looks back on his childhood; Paul himself was educated in a one-room schoolhouse. The story starts in Marias Coulee. Paul lives there with his brothers and his widowed father. Unable to handle the stress of raising three boys, trying to make a success of a homestead, and keeping the house, Paul's father hires a housekeeper from an advertisement in the newspaper. Rose Llewelyn arrives with her brother, Morris, and Morris takes over teaching at the schoolhouse. Most of the stories that Paul relates in this book are about Morris' teaching methods and the passion he brought to the job. Ivan Doig really succeeds in bringing to life an idyllic and probably never-experienced existence. The Millirons live in Montana in the early part of the 20th century, as the world is on the cusp of World War I, and as homesteaders invest in a sure-to-fail irrigation project. There's no rain coming, and it's hard to get people to stay put. None of that comes through in the novel, though. Or it does, but is just barely hinted at, and hardly central to the story at all. What is central to the story is the schoolhouse. And that's really where the heart is in this book. Doig shares the passion that teachers can bring to a classroom, the excitement they can ignite in students, and just how important and effective a good teacher can be in the lives of so many children. It was so fun to read about Morris' lessons, the way he was inspired to bring current events into the classroom, and the humor that came through in almost every vignette. There were other aspects of this book that just didn't make sense to me. For example, Paul is plagued by very vivid nightmares, but I am not really sure what the point of these nightmares was in the narrative. There's also a "mystery" that comes to light later in the story that just seemed utterly random and completely out of place to me, and was resolved in a way that I did not appreciate much at all. And I don't understand why the story was told in flashbacks - in my opinion, it did not really add anything to the narrative. This book took me almost a month to read. I think it's because so few characters really came to life for me. It seemed like no one ever came into focus long enough for me to know him, except for Paul and Morris, and I didn't feel as connected to the people as I wanted to be. I have read and watched so much recently about American history, westward expansion, the Dust Bowl and the Great Depression that I wanted all of that to come vividly to life in a novel. That isn't quite what happened here. But the story was mostly enjoyable, and I think if you enjoy reading about pioneer life or one-room schoolhouses, then you might enjoy this one. I don't think it is for me either. I'm not really interested in pioneer stories. :<) I passed it along to a friend who likes ID. It sounds wistful and idyllic, but difficult to keep reading quickly (when you said a month I wasn't surprised). It sounds the sort of book I'd have liked when younger and would read now, if not enjoy as much, but I would read it. I listened to this book on audio and loved it for all the schoolroom scenes - basically everything with the brothers and their classmates, and Morris' teaching style. I was annoyed by the 'twist' involving Morris and Rose's past, and by how it is resolved. It didn't seem necessary to have that extra drama. I read a novel by Doig earlier this year and really enjoyed it, so I'm excited to get this one from the library.